Plan your holiday on the French Riviera with me, Jeanne Oliver, author and French Riviera resident. I've written about the French Riviera for Frommer's and Lonely Planet travel guides and now I want to share my insider information with you. You'll discover all my favorite hideaways, hidden bistros and local travel trips. So plunge in and start planning your trip! Why not start with this map? Click the destination for more information. Start with my advice on choosing where to stay on the Riviera: Nice, Cannes, Monaco or Menton? Then see my selection of the best hotels on the Riviera--all five-stars! Need to know where to go on the French Riviera? See top sights on the French Riviera for sightseeing suggestions. Love beaches? See my list of the best beaches on the French Riviera. The French Riviera is rich in history; a tour of the Riviera's hilltop villages combines stunning views with a medieval atmosphere. At one time the Riviera was famous for its artists. Read up on the the famous painters of the French Riviera and follow a special itinerary for art lovers. And then there are the renowned festivals that keep the Riviera lively. 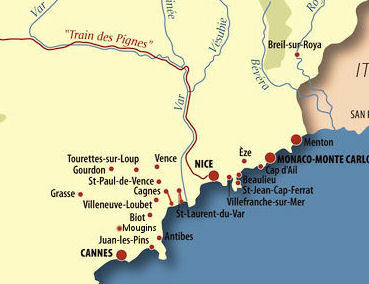 The Cannes Film Festival, Nice Jazz Festival and Nice Carnival are some of the most famous. Or, perhaps outdoor activities are your passion? You'll find plenty to do in the mountains of the Cote d'Azur including some of Europe's best skiing. And what about dining on the Riviera? See my compilation of the finest restaurants on the Riviera, the best restaurants in Nice and in Cannes. And of course you'll want to know how to get around the Riviera whether by bus, train or car.